Colorado Springs, Colorado Hotel's Near Pikes PeakSituated in northwest Colorado Springs with stunning views of the Rocky Mountains, the Staybridge Suites Colorado Springs - Air Force Academy hotel offers an ideal location near the Air Force Academy and minutes from Pikes National Forest.Whether you're here for a quick business trip or an extended stay, this hotel in Colorado Springs, CO has everything you need for a productive stay, including free Wi-Fi access and a Business Center. If you need to host meetings in Colorado Springs, the hotel's boardroom can seat up to 10 people. Additionally, we are near top companies like Lockheed Martin, Current, PRC and Hewlett-Packard.While in Colorado Springs, the hotel's guests can find plenty of activities to fill their free time. The Garden of the Gods features dramatic views of red-rock formations and great recreational opportunities with hiking, biking and rock climbing. 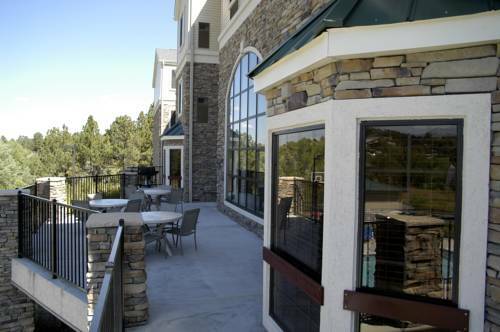 For a more relaxing adventure, the Pikes Peak Highway offers a scenic drive to the 14,110-foot summit.Your comfort is a priority to us, which is why we provide so many quality amenities, including free laundry facilities, outdoor grilling area and a sports court. Join us in the Great Room every morning for a free breakfast buffet, featuring both hot and cold items. You can enjoy a refreshing swim in the outdoor pool or workout in the Fitness Center. Plan your visit at this top extended stay hotel in Colorado Springs, CO.
OLD CHICAGO: A local favorite that serves pizza, pasta, and calzones as its primary dishes. Upstairs there is a lounge with pool tables and night club atmosphere. Located steps away from the hotel's front door. Margarita's at Pine Creek: Fine dining. TGI Friday's: Great atmosphere for a fun and relaxing evening. Food and Drinks SPECIALS every week every day. Childrens's program - Library with Family Board Games and Books. United States Air Force AcademyThe United States AIr Force Academy Visitors Center is a great place to gain knowledge on the Academy. Cadet Chapel is also a major attraction for vistors to the area a must see. Fort Carson Army BaseFort Carson is the "Best Hometown in the Army Home of America's Best." One of the Army's youngest installations, Fort Carson, the Mountain Post, is a proud Army post located southwest of Colorado Springs, Colorado, between Interstate 25 and Highway 115.